There are many scenic driving trails to enjoy in and around Jefferson County. Car and motorcycle enthusiasts appreciate the off-the-beaten paths and natural beauty. With much less traffic, small towns and red lights provide for a more relaxing road trip experience. The Tennessee Trails and Byways program offers a few different driving trails that all traverse Jefferson County, while providing an authentic historical and cultural experience. 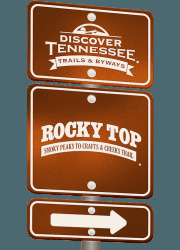 This trail will lead you through the Smoky Mountains to the foothills of East Tennessee. Enjoy scenic views and stops at unique places such as the Bush Beans Visitor Center and historic Dandridge, TN where you can explore boutiques, restaurants, the Jefferson County Courthouse Museum and Archives, and more! Keep on the Sunny Side Trail and make your way through the heart of East Tennessee! This trail will take you on the backroads of Appalachia where you'll discover the rich history of our small towns and country lanes. Starting off in Gatlinburg, TN you will make your way to Jefferson County and discover the roads that lead to Douglas and Cherokee Lakes, Historic Dandridge, White Pine, and Jefferson City, TN. East Tennessee is rich in history and there is nothing more infamous as the history of the prohibition-era. This trail weaves its way along the Moonshine-Running Corridor through the East Tennessee Valley, from the Cumberland Gap to the foothills of the Smoky Mountains. Discover the roads less traveled where moonshiners carried their wears. You’ll discover the Town of White Pine where barns hid gas pumps for “runner’s” pit stops, and in Dandridge TN where the worlds largest moonshine still ever was discovered by authorities in 1973! Stop in and visit the Historic Jefferson County Courthouse Museum and Archives and see another old moonshine still that was used during in the prohibition ear. East Tennessee Crossing (Hwy. 25E) stretches 83 miles in Tennessee from the Cumberland Gap, southeast to the Cherokee National Forest. It has been used since prehistoric times by pioneer travelers, hunters and tourists alike.